Ltd. "Metālmeistars" is a metal processing company specializing in the manufacture of various metal parts on CNC machine tools: sheet treatment (laser cutting, water cutting, shearing, sheet bending, rolling, pipe laser cutting); mechanical processing (turning, milling, sawing, multifunctional turning). 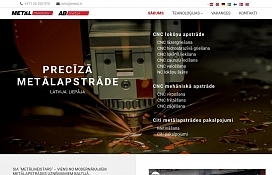 Metalworking, metal products in Kurzeme, Latvia. metal stretching, sheet processing, mechanical treatment, sheet cutting. -CNC water cutting (BYSTRONIC). CNC.